While the Obama administration has been criticized by Republican Sen. John McCain and other advocates of a more assertive U.S. role in aiding the rebels in Syria, public opinion surveys have consistently shown Americans to have little interest in the conflict and have been opposed — or lukewarm, at best, — to getting involved in the conflict. 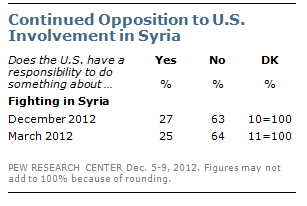 Big majorities of the U.S. public (as well as the publics of many countries in the Mideast) have opposed the idea of the U.S. sending weapons to the rebels — something that President Obama this week decided to do after his administration concluded that the Syrian government had crossed a “red line” by using chemical weapons against its opposition. In a survey conducted last December, 65% of Americans opposed the U.S. and its allies sending arms to anti-government groups in Syria, about the same number as held that view the previous March. About an equal number (63%) of Americans said the U.S. did not have a responsibility to get involved in the Syrian conflict. Those surveys were conducted before the specter of chemical weapons use by the government of Syrian President Bashar al-Assad came into the spotlight. But in a Pew Research Center survey conducted in late April, after claims of chemical weapons use had been in the news, the findings showed only a modest willingness on the part of Americans to take action. A plurality (45%) said they would favor military action against Syria if it was confirmed that chemical weapons had been used, while 31% opposed doing so. A Wall Street Journal/NBC News poll, conducted May 30-June 2, framed the question of involvement this way: “Syrian civilians have been killed by their government in response to protests and civil unrest” and asked those surveyed to choose among a series of actions that U.S. might take. Just 11% supported providing arms to the opposition and 15% backed taking military action to stop the killing. About four-in-ten (42%) said humanitarian assistance should be provided and 24% said no action should be taken at all. 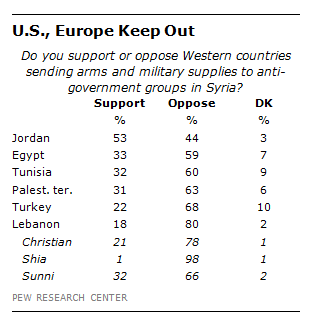 A Pew Research Center survey conducted in March also found opposition abroad to the U.S. or allies sending arms to the Syrian rebels. In Turkey, Lebanon, Tunisia, Egypt and the Palestinian territories, roughly six-in-ten or more opposed western countries sending arms and military supplies to anti-government groups in Syria. The only support for such aid came in Jordan where 53% backed military help for the rebels from the West. Similarly, majorities in France (69%), Britain (57%), Turkey (65%) and Germany (82%) — like the U.S. public — opposed their own countries sending arms and military supplies to the rebels.